Through the WhatsApp of "El Comercio", a user caught a UFO or Fireball in free fall apparently plunges to the ground near the oval monitor Av. Javier Prado in Lima, Peru but then the object disappeared. 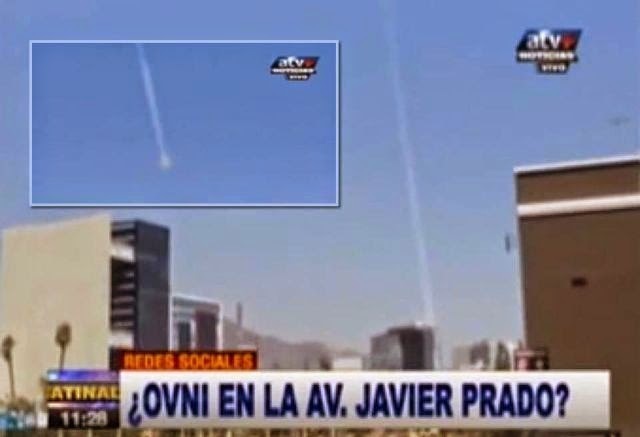 According to El Comercio witness David Bauman could observe the strange phenomenon around 10:00 am on April 28, 2015 when he headed in a taxi at Av. Javier Prado towards the hill of La Molina. "I saw a light fell from above a little behind and then I could record it as shown in the video. When I went up the hill tried to see if he had fallen into a nearby area or what happened, but I saw nothing," said Bauman. Later, another citizens contacted El Comercio to point out that also they saw a similar object falling near the Jockey Plaza Mall, in the same direction that was reported by others. Although many people witnessed the phenomenon, no one could precisely describe the nature of the object.